I am a grandfather organizing Legos for our four year old grandson. We have an iMac. How should I proceed to take advantage of your wonderful contribution to the world of Lego? I am unable to open the files on our iMac with Mavericks. However, I would be happy to buy a printer. Thanks tom for continuing to update the labels, I have used every single one so far and cant wait for the next update! @Paul, Which labels do you need next. Please indicate specific Part #’s, or collections of related parts. 30241/30241b, 2921, 30136, 30236, 52107, 30237/30237b, 30137. Here is a picture of the labels is use so far! Hi , im wondering if you are able to send them for a normal printer. I dont have a brother labeling and here in Australia they dont sell them , we get DYMO. I bought a brother one at costco but it didn’t came with software or cables to upload the files. even if you just share a high quality JPG or PNG of all the labels like the examples you show i can then cut out and print the labels in normal mail labels. @Paco Lira, If you download the labels, you will find scripts (PC only) which you can use to re-create the tiny images for each brick. That said, creating all the labels is still extremely time consuming. You might be able to download the brother software from their website. The USB cable is a standard one you can buy anywhere (if you don’t already have one). @Paco, Tom is correct. I also bought a brother which come with no software. I went to the brother website, entered my printer serial and model no. and wa-Lah driver and software for my PC! wow! these are wonderful! i have been organizing my son’s legos (a collection going back over 20 years) and I have been so annoyed with the “storage labels” online (basically COLORS…NOT the best way to sort legos at all but apparently I am the only mom who thinks this). THANK YOU!!! Thank you so much for creating these labels. I bought a label maker and this is making our organization so much easier. Please keep adding more labels. We literally have hundreds of Lego creations and lots and lots of pieces. I’ve used up 4 organizers so far and have many pieces yet. Or if there’s a way I can create my own labels please explain. Hi Tom, I don’t know if you are receiving my emails but I have emailed you 30 or so labels I created for you too add to your collection and share with your followers if you wish. If I don’t hear from you I will just post a link to them. But id rather you did it. the file is not working. it saying it has bad format. can you give me step by step on how to print the lable please? I am a 13 years old Quebecer passionned by LEGOs. Your blog really helped me a lot (I am a bit the sorter master of the family sometimes ^_^) to sort my LEGO bricks. Thanks you ! Thanks so much for these labels Tom. They’ve been a great help in sorting and organizing my LEGO collection. You can also add the Brother P-Touch PT-2300/2310 as compatible. I only needed to move the images to the right 3-4 spaces and then they worked perfectly for my printer. The only problem is they’re so good, I can’t imagine using anything else and there are some elements that obviously aren’t included. Where did you get the images of the elements? I’d like to try creating my own labels for the ones that I’m missing. I’d also like to echo the suggestion of a paypal donate button. These labels are gorgeous and are EXACTLY what I’ve been looking for but I have a Mac. Has anyone had any luck printing the labels from a Mac to a Brother label maker? I think the “scripts (PC only)” comment is throwing me… Will the Brother software be able to read these scripts even though I have a Mac? @Liz, I have heard confirmation that the labels work fine on a Mac, the Scripts only apply if you want to create additional labels with pictures of the LEGO parts that match these exactly. If you just want to print the complete set of labels I’ve designed so far, you can do that on a Mac with no problem. Thank you for all of your hard work! How do you create the images that you use on the labels? I would love to be able to make my own to fill in some gaps. Can you put this into a Word file where the images could be printed out onto regular sheets? I agree with the donations button as well as add a Pinterest button. Thank you for doing this in a way that makes sense! Where did you get the pictures of the lego elements? @Ben, i have a set of scripts that create the images using the LDraw App. There is a copy of the script in the downloadable labels .zip file, but I have recently learned that the scripts do not work reliably. I am working on updated scripts which will match the appearance of my labels, and an updated version of my labels which I hope to share soon. @Sarah, I’m sorry, but these labels were carefully designed to print with the Brother Label printer which is listed on this page. I chose that printer as it is economical and the labels have good adhesive and are waterproof. 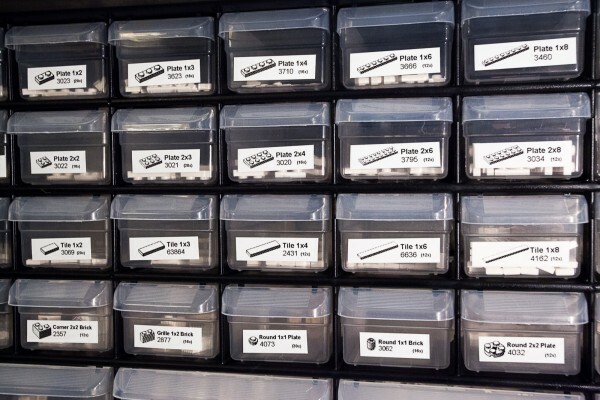 The 1/2″ labels are a great size for use on AKRO bins, or other organizer drawers / bins. Besides, It would be impractical for me to maintain two versions of these labels. You can try to design your own labels in Word if you like. Hi Tom – What you have created is simply a masterpiece! My son (now 7) has an endless sea of Legos. I had (coincidentally) picked the same Akro Mills organizers. We fit everything except very large parts into 5 of those bins with many drawers divided in half with the Akro Mills dividers. When I went searching for labeling solutions and came across your work it was like a dream come true. I purchased the Brother PT-P700 and am happily using it on the Mac. The software crashes often but I am able to deal with that. I am about half way through labeling all the drawers. There will surely be parts (like a number of different types of wheels and tires) that are not in your latest version but that is too be expected. You’ve saved me an enormous amount of time and we are extremely thankful. I just updated the downloadable labels to include new scripts which allow you to create your own LEGO brick images that match the rest of these labels. The scripts only work on a PC with the LDraw App installed. I also added some new labels tot he collection, and plan to add some more in the next couple weeks. I’m re-organizing my own LEGO collection and filling in the gaps in the Label collection as I go. Thanks Tom!! Your efforts were perfectly timed. I rescued our last Windows machine from the electronics recycle bin and got your scripts up and running on them. My son and I cranked out a bunch of the remaining labels we needed. I think we are down to about 20 more and will get them done today and we’ll check this project off the list. I didn’t investigate but if LVIEW is available for Mac then I would imagine I could get it working on the Mac as well so we can get rid of the Windows machine (again). FYI – I added a second parameter to the script and use that to name the resulting png file. So our syntax is like this %1 = part number as you have it %2 = part description (Ex: “Brick1x2withnotch”) and the file name becomes %1%2.png. That made it a bit easier to recognize the files. Many thanks. What you have done is wonderful and very much appreciated!!! thank you so much! i’m a mom to 4 lego crazed boys, and they have been begging me for years to label their collection! i was at a loss until i found your link on pinterest! you’ve “saved me”! printing them all now and looking forward to sorting them together (kind of…)! will be watching to see if you add more…amazing work! OMG, this is so awesome. I’ve been trying to label my pins for almost 13 years and I was never able to make picture labels for everything and just had to settle for the part number and common name printed on a label. Thank you so much for doing this. This is really awesome! Just what I was looking for…. Just bought the labeler and can’t wait to try it out! thank you!! Hi Tom, I couldn’t find the technic bent liftarm labels in your collection, so I made my own and would like to share. Hope it helps! If I may ask, would it be possible to request further additions to the labels? For example, I’d love to see plant parts like 2417, 2423, 30176, 6064, 30239, 3742, 6255 and 3741 in a future update. Also helpful would be Lego Technic parts, more Minifigure options and SNOT elements (92411 and the like). Do you know if the brother QL printers work? Darrin, I have not verified that these work with the Brother QL Printers, but it should work since those printers are compatible with the same “P-touch Editor” application as the PT Series printers. You might need to rearrange the images and text for the larger label size. Please let us know if you give it a try! I am computer literate but not yet familiar with Ldraw. Are there directions/tutorials available someplace to describe how to use your scripts to create additional labels? Thanks so much for all of your hard work! My drawers are looking great! Like Raquel, I do not have a label maker and would like to use my computer. I just need images, not label-ready files- I don’t mine pasting screen shots into a document and printing on a solid sheet of adhesive paper then cutting them up. Dear Tom; This solution looks great. I have been searching this for a while. Some technical questions; What color printer should be recommended, and even a wireless solution ! I want to have bricks/parts printed in the color they actually is. Is this possible in the “system” you have made ? What color printer should be recommended, and even a wireless solution ! There is no easy solution to your request because these labels were designed for a black-and-white printer which is especially well suited to this purpose because the labels are very sticky, plastic, and waterproof. The attach really well to plastic drawers like the Akro-mils brand which I prefer. One option is to order colored label tape, and print the black and white labels on appropriately colored tape. Another option is to not worry about color for the labels, since the drawers are clear and you will be able to see the color easily enough. I hope this is helpful as you consider options for labeling your bricks. Excellent labels, really useful. Just one question, which file are the hinge labels / clip hinges in? I do not know where the Hinges / Clips went. They were definitely a part of the collection at some point since my own drawers have nicely designed labels for various hinges and clips. I will fix this in an upcoming update. Please help with what program opens the LBX files? I’m in the US. This is such an awesome set of labels if I can open them. you need to install the software which comes with your Brother Label Printer, such as the PT700 listed in this article. What are the dimensions of the labels? I want to make sure they will fit on my storage comtainers before I buy the printer. Hey Tom. I’m having serious issues with creating these images. It seems as if it never creates the images at all. Batch code runs fine, and LDraw snapshot location is specified, but no png files are created. I used the call functions with all the part numbers I needed, but nothing. Never mind. I figured out what went wrong. It turns out I needed to run the scripts changing the folder to the one I was working on, with the regular “cd BROTHER_LABELS” commands. Hello Tom, thanks for your effort to make this labeling happen! I currently do not own a brother printer but would like to use this program, could you please email me the serial number so that I can download and use the program? Thank you in advance. Have a nice day! Wow, this is truly amazing. Thank you so much for sharing! I referred to your page on my Amazon review of the cabinets I had just purchased prior to discovering your labels (https://www.amazon.com/review/R2JSMEDQJCIDUE/ref=pe_1098610_137716200_cm_rv_eml_rv0_rv). I attached your photo of the labels too (and mentioned it was from your site) – hopefully that is ok with you (let me know if it’s not). Fantastic job with the sorting techniques Tom. I do’t own a Brother label maker, but is it possible to transfer the labels over to a word document and print them on that? Great system. I bought the printer, what software do I use to open the files? Not too technically savvy. what software do I use to open the files? John, the printer will come with the software you need, (or at least the instructions to download the software from the web…) On the PC, the application is called “P-Touch Editor”.